You are about to enter into a world that is rarely seen and that is quickly vanishing. The photographic exhibition 'Patterns, Passages and Prayers', offers a look at the ancestral ways of life of mountain peoples, who for centuries have called the Golden Triangle home. Their existence is intimately tied to the land that nourishes them and finds form in their culture, daily lives, and spiritual practices. Take your time to enjoy these photographs and experience the people who have graced my path, images that compliment well the traditional ambiance of the Tamarind Village. 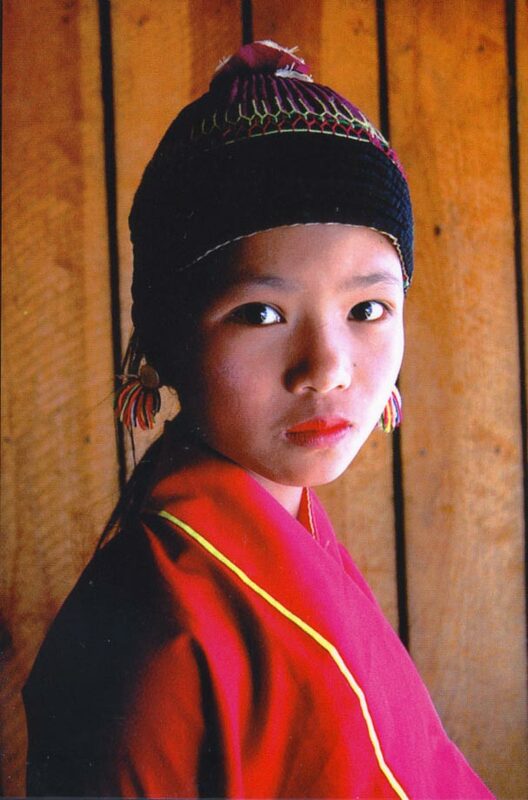 Patterns, Passages & Prayers: Traditional Culture of the Golden Triangle’ comprises more than 50 stunning photographs by American researcher Victoria Vorreiter as well as a number of fascinating tribal artifacts. The images focus on the beauty of the simple, daily activities of the region’s tribal peoples such as weaving and harvesting crops and on their rites of passage such as birth, courtship, marriage and death. The images are accompanied by Vorreiter’s own journal entries, helping to bring the subjects to life in an intimate and insightful way. In addition to the photographs, rare objects including sacred Mien texts, Karen musical instruments and a dazzling collection of children’s caps are displayed to highlight themes such as identity and the role of festivals in courtship. Victoria Vorreiter, a classical violinist by training and lecturer at DePaul University of Music in Chicago, began to focus her attention on the role of music in tribal cultures over a decade ago. Her passion for the subject inspired her to move to Chiang Mai in 2005 and to travel to remote parts of Thailand, Laos, China and Myanmar in order to document and study the little known music of the region’s tribal peoples in a series of films and photographs. Since then, her work has resulted in a number of exhibitions, a film series and a beautifully illustrated archival book ‘Songs of Memory’ along with a CD of ancestral songs. Apart from collaborating with Victoria on the ‘Patterns, Passages and Prayers’ exhibition, Tamarind Village was a major sponsor of Victoria’s ‘Songs of Memory’ Exhibition at The Chiang Mai Cultural Centre which opened in April 2010.For more information on Victoria’s fascinating work, visit her website at www.TribalMusicAsia.com. The foothills of the Himalayas, where Thailand, Laos, and Myanmar once knew no boundaries, harbor a staggering variety of peoples living in remote mountain villages. Originally migrating from Siberia, Mongolia, and the Tibetan Plateau in a southerly trajectory through China, they number over one hundred thirty groups and subgroups, each tribe representing an extraordinary, unique world, distinctive in language, customs, arts, religion, dress, and features. Preferring high altitudes, these groups live as hunters and subsistence dry-field farmers, practicing swidden agriculture on steep, forested mountain slopes. Despite the necessity for frequent migrations in search of harvestable terrain, they have flourished, maintaining their independence and identity to a high degree. Indeed, it is possible for two common subgroups to have developed in such isolation that their languages and traditions are incomprehensible to each other. 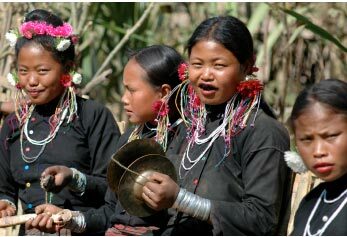 This diversity in peoples highlights the stunning variety found in culture, spiritual beliefs, and musical traditions found in the Golden Triangle. The clothing of the traditional peoples who inhabit Southeast Asia evolved gradually over time, creating a functional and fantastical complex of garments (tunics, skirts, trousers, robes); accessories (bags, belts, leggings, bandoliers, aprons, headscarves); and jewelry (headdresses, earrings, necklaces, bracelets, rings, leg rings, chains, pendants, utility instruments, clasps, buckles, buttons, coins, and beads). All of these are vividly and intricately adorned with symbolic motifs and stylistic patterns, which together reveal the universe of the people who create them, reflecting their history, spiritual beliefs, environment, and aesthetics. In considering these textiles and adornments carefully, one begins to appreciate their significance and meaning at a variety of levels. Tribal clothing serves most importantly as protection from the elements, shielding the body from the wide range of temperatures and weather conditions that occur throughout the seasons in the mountains and forests. But garments and regalia, which remain little changed over the centuries, also serve in other profound and discrete ways by: maintaining the identity of a community; representing wealth and status; indicating stages in the life cycle, from birth to death; signaling special positions in the village hierarchy; allowing spiritual intermediaries and healers to be transformed so they might communicate with the deities; expressing physical beauty, an asset of great importance in finding a mate; and demonstrating skill and artistry. Rituals inspired by music are intimately bound to life cycles, ushering every member of the community through the important thresholds of his or her life. Birth is of major significance, as children are the promise of every family, providing helping hands, maintaining continuity of the clan, and preserving tribal customs. Numerous ceremonies revolving around childbirth—before, during and after—are carried out to ensure that the child will grow into adulthood. 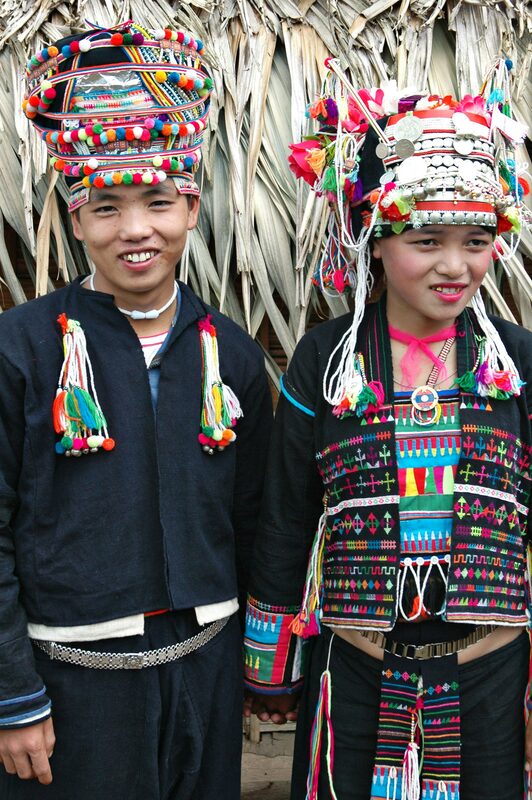 The end of harvest and the occasion of the New Year Festival signal the traditional period when young men and women visit other villages to seek a mate. Every tribal group has a vibrant repertoire of music for courtship. Conversing in tones is no quaint tradition, but a time-honored way to determine a life partner. Marriage is a fundamental aim in life, for, as the tribal saying goes, “one hand cannot clap alone.” When a young man and woman wed under traditional guidelines, prescribed rituals must be carefully carried out to maintain harmony in both family and village. The occasion calls for sacred music and ceremony to celebrate the merging of two families or clans, honor the ancestors, propitiate the spirits with offerings, and instill the couple with ancestral wisdom. In all highland societies,weddings are elaborate affairs that require ample preparation and extensive rituals. Songs and myths infused in daily life make ancestors contemporaneous with their families, so that they remain alive in the home and in constant communication. When a person passes away, it is essential that proper rituals be carried out so he or she may join his forebears. Guided by the intoned liturgies and laments of a shaman, funerals in every tribal culture provide extensive music, offerings, prayers and rites to guide the deceased to the spirit world. Rooted for millennia in a landscape that sustains every aspect of existence, the traditional peoples of Southeast Asia have fashioned a complex belief system based in nature that is all-inclusive. Man, the environment, the universe, and the spirit world are inextricably intertwined. The mountain peoples practice animism, a belief that the natural world is organized and ‘animated’ by the supernatural world. Every entity in nature, living or inanimate, has a soul. Spirits inhabit things and places in nature—rocks, rivers, trees, fields, mountains, wind, sky—and areas that are important to social life—the home, altar, village. Spirits may reside in objects, shamanic tools, and musical instruments. 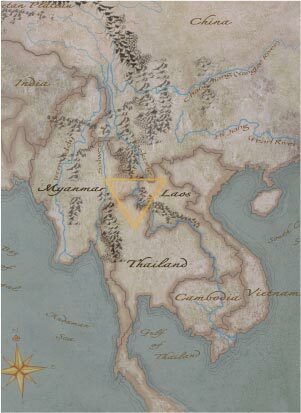 The spirits of ancestors are dynamic, ever-present and all-important beings, guiding and protecting every household.All tribal groups of Southeast Asia have fashioned an intricate web of deities, ancestors, souls, and spirits who shape their world and with whom they interact on a daily basis. Paying proper homage to the pantheon of nature and ancestor spirits becomes crucially important to each of these groups in order to maintain the good relations that ensure health, abundance, and good fortune. Consequently, the peoples have developed a complex of sacred rituals to venerate the benevolent spirits and to banish the malevolent. A hierarchy of shamans, priests and acolytes, apprenticed in ancestral mysteries, oversees the rites that keep the universe in balance.Their means of communication is through melody and rhythm, for music is the language of the spirits.